The first ever National Bowling Championships took over the Central Lanes bowling alley all weekend with a trio of young bowlers making a big name for themselves, claiming all three championship top spots. 15-year-old Noah Taimanglo was crowned open champion, 15-year-old Frank Manibusan Jr. won classified champion and 12-year-old Evan Duenas won as the youth champion. The event concluded with an intense three-person ladder featuring Taimanglo, Ceaser Villanueva and the unlikely Jae Sang Lee, who propelled into the top three after bowling a 299-game from outside the top 10. “I wasn’t thinking about it too much, but bowling that near-perfect game was crazy,” said Lee, who missed the perfect game on the 10th pin. Taimanglo and Villanueva featured a back-and-forth game until Taimanglo caught fire, nailing five straight strikes through from the first to sixth frame that had plenty of the veteran bowlers oohing at his performance. “There were so much nerves and the amount of pressure I had on myself was tough. But hitting those five strikes in a row made me really feel like I was taking over,” said Taimanglo of his final match. Villanueva hit two spares in the opening frames, but started to pick up steam hitting strikes from the third to seventh frame, but a 7-1 split in the 8th started to widen the gap. Taimanglo’s spare in the 7th was quickly forgotten as he bowled his way to a stellar 279 game while Villanueva claimed second place with his 260 game. “I think the youth really proved themselves out here this weekend, not only to the veterans but also just being able to represent Guam,” added Taimanglo. The classified champion in Frank Manibusan Jr. is not only a young 15-year-old on the verge of 16, but also a bowler with just two years of experience. His rise to the top can be attributed to hitting the lanes with dad Frank, who helped adjust his game. “I was really bad at throwing with one hand, but I managed to switch to two-hand bowling and I started performing much better,” said Manibusan Jr.
Manibusan said he was surprised to win it all, but he didn’t lack confidence as he displayed poise from the opening roll. “I bowled really good in the first game and I felt like I could push my way to that number one spot. It’s really competitive every time you bowl and I’ve learned a lot through my mistakes which really helped me out today. I’ve also met a lot of great people along the way,” added Manibusan Jr. The IIAAG has adopted bowling as a high school sport for the first time ever, which will feature the athletes like Taimanglo and Manibusan. 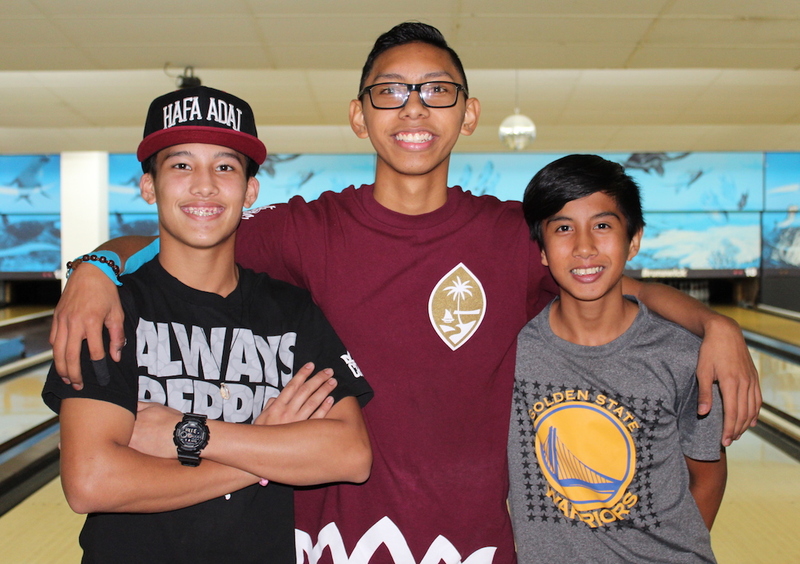 Aside from now being able to bowl in highs school National Bowling Congress’s Joey Miranda explained the future for Guam Bowling is on the up-and-up. “The future is definitely bright, and we want to get these kids ready to compete in some upcoming international events, but to ultimately be ready for the East Asian Games in 2019,” said Miranda. The first ever National Bowling Competition over the weekend was a first, but it won’t likely be it’s last. “Competitions like this, and the ones held at Central Lanes monthly, as well as the upcoming IIAAG league, will give these kids all the chances to hone their skills and we’re really excited about that. Our goal is to also get more bowlers to come out to play and practice,” added Miranda. Classified Champion – Frank Manibusan Jr. The Top 3 Finalists – Jae Sang Lee, Noah Taimanglo and Ceasar Villanueva.